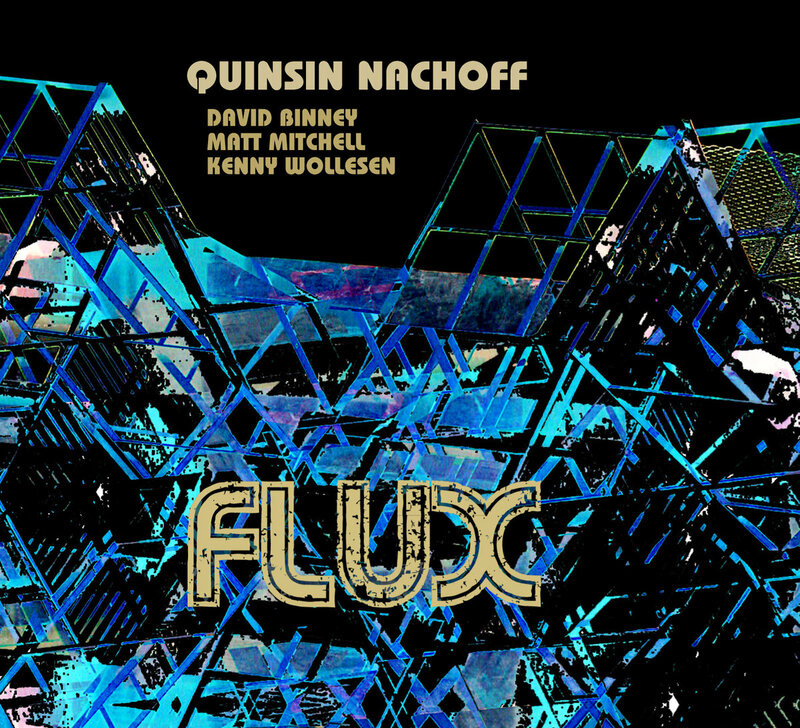 Saxophonist and composer Quinsin Nachoff brilliantly captures the sound of evolution on his latest release, Flux, due out September 16 from Mythology Records. Exploring the elusive terrain between modern jazz and contemporary classical, between the cerebral and the organic, Nachoff reveals a fervently original sound that evokes bold, incisive playing from a singularly innovative quartet. Nachoff's vision asserts that the state of flux can represent shape-shifting invention rather than uncertainty - though he's certainly not afraid to venture into the untested unknown. These four come together to breathe vivid life into Nachoff's wide-ranging compositions, which continue to develop his longtime interest in fusing together eclectic influences from jazz and classical music. Don't mistake this for a "Third Stream" or "chamber-jazz" project, however; this is radically creative music that forges its own path. "The kind of music that I'm interested in making isn't straightahead in either genre," says Nachoff, who has composed for string and brass ensembles as well as jazz big bands. "I like mixing and matching things. I try to find commonalities between them to put people into different landscapes to improvise in." Flux was born out of a time when Nachoff's life was in a state of flux itself. The Toronto native was in the process of moving to New York City and finding a new niche for himself in the jazz mecca's ultra-competitive scene. "It's quite a transition going from working a lot and teaching at well-respected schools to starting again from scratch," he says. Nachoff discovered kinships with the members of the Flux quartet in different ways: Binney on shared gigs with bassist Michael Herring, Mitchell during an Australian tour under Nachoff's leadership, Wollesen simply through hearing the drummer play with bassist Eivind Opsvik's Overseas ensemble. "I was blown away by his incredible feel," Nachoff says of his first experience hearing Wollesen live. "I was infatuated with his hi-hat the whole night - which was only playing quarter notes!" At the core of the sound of Flux is two pairings - the twin saxophone frontline, and the alchemical, opposites-attract meeting of Mitchell and Wollesen. "The concept was to put more heady material that Matt can deal with on top of this really organic feel that Kenny does and have it work as a band sound." The compositions that Nachoff brings to the quartet fully explore that tension between the band's virtuosity and passion, which fuel each other in thrilling ways. With the two saxophones, Mitchell playing a variety of keyboards including Fender Rhodes, organ, Wurlitzer, and Moog, and Wollesen incorporating a variety of handmade percussion instruments, the palette that Nachoff had to work with, in his often surprising orchestrations, was vast. Several of the pieces on Flux began life as commissions for classical ensembles, reinvented for and by the quartet. Aptly-named opener "Tightrope" is Nachoff's response to the Toca Loca ensemble's request for a "pop" influenced piece - allowing for as abstract an interpretation of that proviso as desired. The piece follows a loose verse-chorus structure with an underlying rock feel to the rhythm - and Mitchell interpreting two keyboard parts into one intricate whole. "Complementary Opposites" is derived from a suite penned for trumpeter Peter Knight's 5+2 Brass Ensemble and is built on surprising juxtapositions of style and rhythm - as when a reggae groove suddenly takes over the piece somewhere in the middle. The two-part "Mind's Ear" comes from a suite written for the Greg Runions Jazz Orchestra that featured Nachoff and trumpeter Tim Hagans (who gave the piece its name) as guest soloists. The pieces are marked by unconventional harmonic motion and jarring tonal shifts. The evocative title of "Astral Echo Poem" is an anagram for the name of its primary influence - Brazliian composer Hermeto Pascoal. Finally, "Tilted," which erupts with nervous energy, is an apt bookend with "Tightrope," drawing once again on hard rock inspirations for its driving beat, complicated by the fleet, snarling melodies. A graduate of the University of Toronto, Nachoff has been colliding genres since his 2006 debut, Magic Numbers, which melded a jazz trio with a string quartet. He's since composed music for a variety of ensembles in both worlds, including the Penderecki String Quartet, the Toronto Jazz Orchestra, and the Cecilia String Quartet, as well as his own Horizons Ensemble, Quiescence Quartet, and FoMo quartet. He also leads the Pyramid Project, which brings together saxophone, brass quintet and drums and features Ralph Alessi, Jonathan Finlayson, John Clark, Ryan Keberle, Marcus Rojas and Jim Black. As a sideman he's performed and/or recorded with Kenny Werner, Howard Johnson, Tim Hagans, Kenny Wheeler and Don Thompson among others. He has coached at the Banff Centre for the Arts and taught at the University of Toronto and Humber College, as well as serving as artist-in-residence at the Queensland Conservatorium in Brisbane, Australia.